US Defence Secretary James Mattis said there will be a wider investigation into US naval operations over the collision. Singapore: Ten US sailors were missing after a US warship collided with an oil tanker east of Singapore before dawn on Monday, tearing a hole beneath the waterline and flooding compartments that include a crew sleeping area, the US Navy said. US Defence Secretary James Mattis said there will be a wider investigation into US naval operations after the collision between the guided-missile destroyer USS John S McCain and the tanker Alnic MC, the second involving a US Navy destroyer and a merchant vessel in Asian waters in little more than two months. 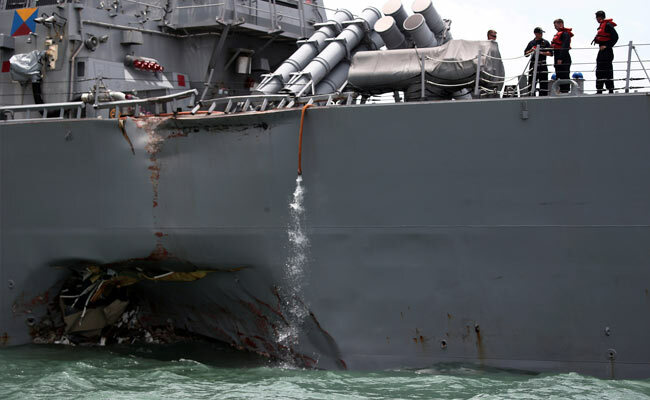 The ships collided while the US warship was heading to Singapore for a routine port call, the Navy said in a statement. The destroyer had made its way to Singapore's Changi Naval Base by Monday afternoon under its own power. Significant damage to the hull had resulted in flooding to compartments, including crew berthing, machinery, and communications rooms, the Navy said, but crew members were able to stop the flooding. Four of the injured were taken by helicopter to hospital in Singapore with non-life threatening injuries. The fifth needed no further treatment. The USS John S. McCain's sister ship, the USS Fitzgerald, almost sank off the coast of Japan after it was struck by a Philippine container ship on June 17. The bodies of seven USS Fitzgerald sailors were found in a flooded berthing area. Mattis told reporters in Amman, Jordan, there would be a broader investigation into US naval operations. "The chief of naval operations' broader inquiry will look at all related accidents at sea, that sort of thing. He is going to look at all factors, not just the immediate ones," he said. Collisions between warships and other large vessels are extremely rare, with naval historians going back more than 50 years to find a similar incident. A search-and-rescue mission was underway for the sailors missing from the USS John S. McCain involving Singaporean ships, helicopters and tugs, as well as US Navy aircraft. Reuters video footage from the Singapore Strait showed an area of impact about 6 metres (20 ft) wide in the John S. McCain's port side. The US Navy said the amphibious assault ship USS America had arrived to provide messing and berthing for crew of the USS John S. McCain. It would support the search for the missing and divers to assess the damage. A crew member on the Alnic MC told Reuters by telephone there was no oil spill from the Liberian-flagged, 183 metre-long (600 ft) tanker, which was carrying almost 12,000 tonnes of fuel oil from Taiwan to discharge in Singapore. "We have not discharged the tanker yet," said the crew member, who asked not to be identified. "We are proceeding to Raffles Reserved Anchorage, where the owners will investigate the matter. There was some damage to the valve but no oil spill." Stealth Maritime Corporation, the Greece-based owner of the tanker, said the vessel was moving to safe anchorage for assessment. Reuters later saw the Alnic MC anchored off Singapore. Singapore's Maritime and Port Authority (MPA) said no injuries were reported on the Alnic, which suffered some damage above the waterline. "There is no report of oil pollution and traffic in the Singapore Strait is unaffected," the MPA said, adding that the collision happened in Singaporean territorial waters. However, the Malaysian navy said the collision happened in Malaysian waters and it had sent vessels to assist. The Pedra Branca area near where the collision happened has long been contested by both countries, with an international court ruling in Singapore's favour in 2008. Malaysia filed an application to review that ruling this year. "The Malaysian agencies are not involved in the search and rescue operations that is led by Singapore," the MPA said. The US Navy said Malaysian navy vessels and a helicopter joined the search in the afternoon. Indonesia said it had sent two aircraft and two warships to help. The waterways around Singapore are some of the busiest and most important in the world, carrying about a third of global shipping trade. Ben Stewart, commercial manager of Maritime Asset Security and Training in Singapore, said early indications suggested the warship may have turned across the front of the tanker. "Instances like this should be rare and they are rare," Stewart said. The US Navy said last week it had removed the two senior officers and the senior enlisted sailor on the USS Fitzgerald following an investigation into that collision. The USS Fitzgerald and USS John S. McCain, built in the same shipyard, are both ballistic missile defence (BMD) capable ships and part of the same Japan-based destroyer squadron. The Seventh Fleet has six ships assigned to BMD patrols, with half on patrol at any time. The accidents come at a tense time. The USS John S. McCain carried out a freedom of navigation operation in the South China Sea this month, coming within 12 nautical miles of an artificial island built by China. The operation was the latest to counter what the United States sees as China's efforts to control the waters. China denounced it. North Korea threatened last week to fire ballistic missiles towards the US Pacific territory of Guam after US President Donald Trump said he would unleash "fire and fury" if North Korea threatened the United States. "Thoughts & prayers are w/ our @USNavy sailors aboard the #USSJohnSMcCain where search & rescue efforts are underway," Trump said on Twitter. The US vessel involved in the latest collision is named for the father and grandfather of US Republican Senator John McCain, who were both admirals. Senator McCain, a Vietnam War naval pilot who was shot down and held prisoner for 5-1/2 years, is undergoing treatment for brain cancer. "Cindy & I are keeping America's sailors aboard the USS John S McCain in our prayers tonight - appreciate the work of search & rescue crews," he said on Twitter, referring to his wife.